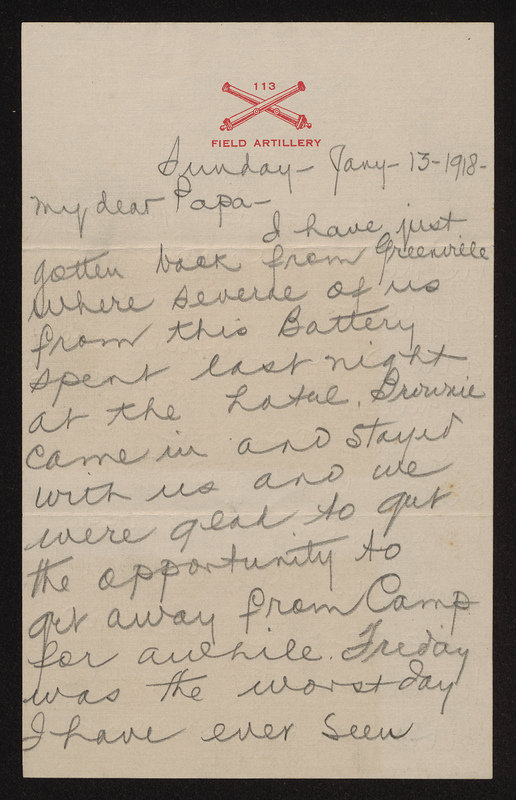 Letter from Richard Dillard Dixon to his father, written January 13th, 1918. I have just gotten back from Greenville2 where several officers from this battery spent last night at the hotel.3 Brownie4 came in and stayed with us and we were glad to get the opportunity to get away from camp for awhile. Friday was the worst day I have ever seen anywhere–rain–hail and snow all day and night with a very high wind. 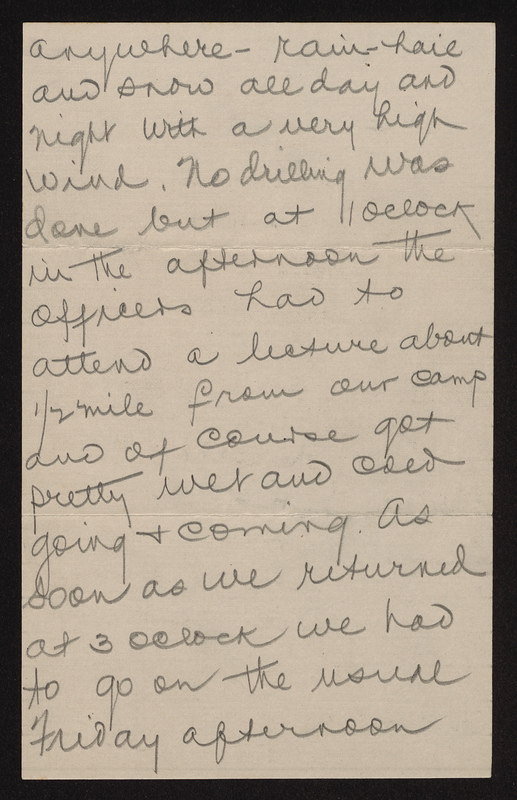 No drilling was done but at 1 o’clock in the afternoon the officers had to attend a lecture about ½ mile from our camp and of course got pretty wet and cold going & coming. As soon as we returned at 3 o’clock we had to go on the usual Friday afternoon examination in this drenched condition but about 4:30 the lights went out and Major Bulwinkle5 who was in charge told us to hand in our papers. 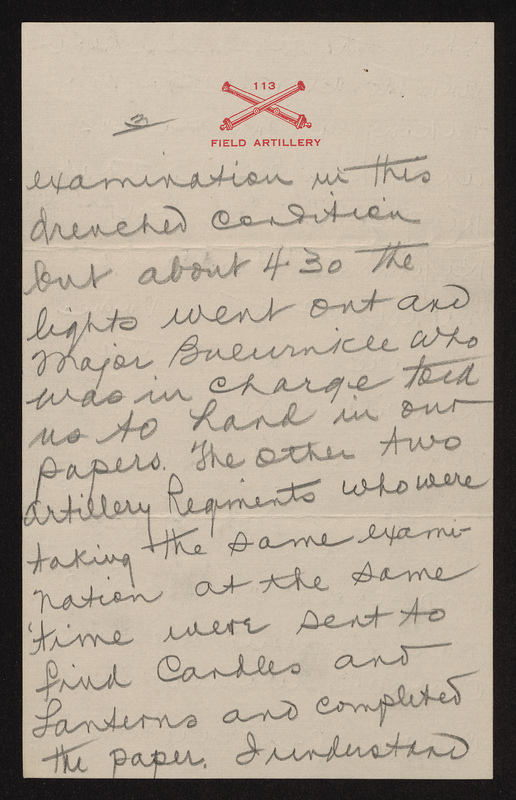 The other two artillery regiments6 who were taking the same examination at the same time were sent to find candles and lanterns and completed the paper. 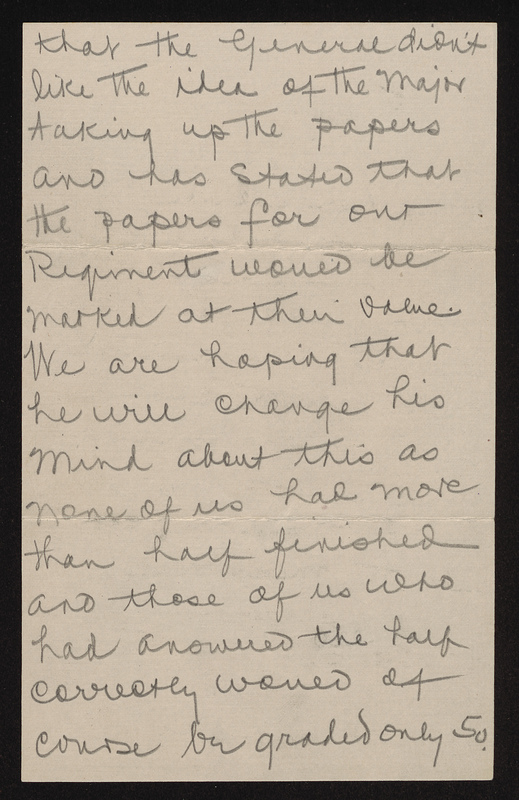 I understand that the general6 didn’t like the idea of the major5 taking up the papers and has stated that the papers for our regiment would be marked at their value. We are hoping that he will change his mind about this as none of us had more than half finished and those of us who had answered the half correctly would of course be graded only 50. 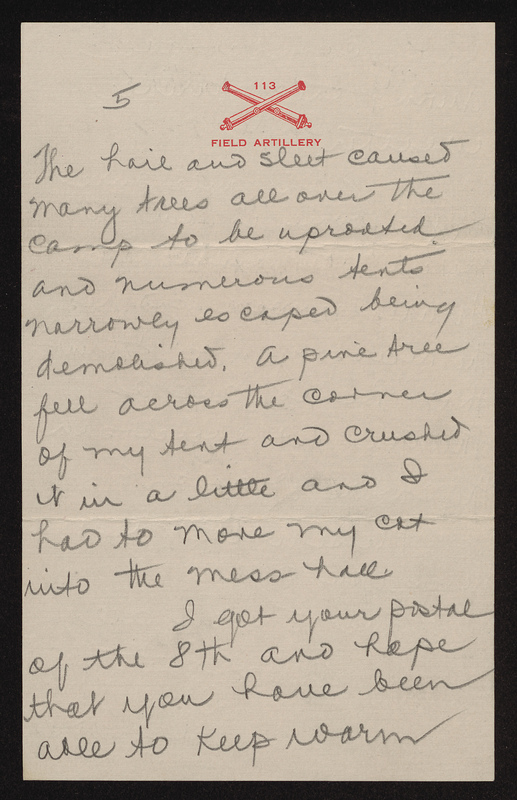 The hail and sleet caused many trees all over the camp to be uprooted and numerous tents narrowly escaped being demolished. A pine tree fell across the corner of me tent and crushed it in a little and I had to move my cot into the mess hall. I got your postal of the 8th and hope that you have been able to keep warm and comfortable during this terrible weather. 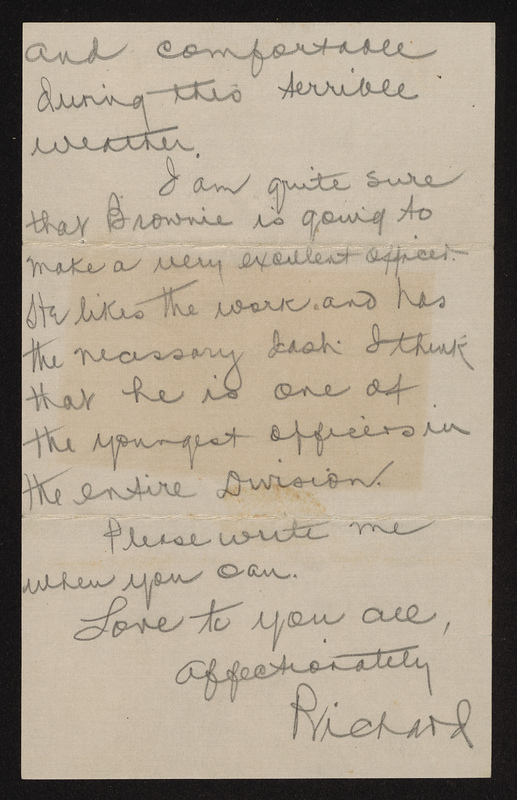 I am quite sure that brownie is going to make a very excellent officer. He likes the work and has the necessary [dash?]. I think that he is one of the youngest officers in the entire division. Please write me when you can. Probably the Imperial Hotel; views from the National Register of Historic Places, link: http://www.nationalregister.sc.gov/greenville/S10817723034/index.htm. 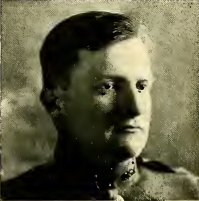 Commanding officer of the Second Battalion, 113th Field Artillery. An attorney from Gastonia, North Carolina, he later served as a congressman. Biography included in the North Carolina Dictionary of Biography, link: https://www.ncpedia.org/biography/bulwinkle-alfred-lee. Photograph from the History of the 113th Field Artillery. link: https://archive.org/details/historyof113thfi00flet. The 30th Division originally included two other field artillery regiments: the 114th Field Artillery and the 115th Field Artillery.